Aim: To determine the socio-demographic characteristics of cancer patients. Materials and Methods: Review of the Cancer registry, and patient interview. Information on socio-demographic profile, medical history, family history and previous treatment, if any, was retrieved from the patient. If the patient couldn't be contacted then information was taken from pathology/radiotherapy or medical records department. Results: A total of 684 patients participated in the study. More than 40% of males and 53.7% of females were illiterate, P < 0.05. The majority (33.5%) of participants were of low socioeconomic status. The most frequently reported cancer (ca) in males it was ca lung (40.9) and ca oesophagus (9.8). 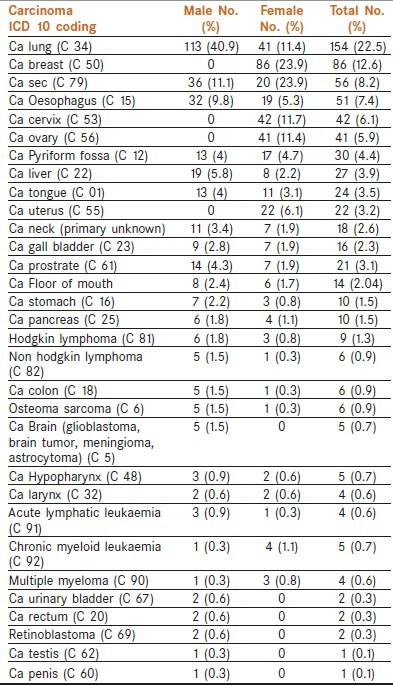 In females most common cancer were ca breast (23.9) followed by ca cervix (11.7). Cancer registration is the process of continuing, systematic collection of data on the occurrence and characteristics of reportable neoplasms with the purpose of helping to assess and control the impact of malignancies on the community. Of the two, population based (PBCR) and Hospital based cancer registry (HBCR), HBCR limits its aim to record the particulars of cancer cases seen in a given hospital or group of hospitals irrespective of boundaries of geographical areas. The purpose is to serve the needs of the hospital administration and above all, the individual patient. It also tends to improve the cancer therapy, provides the baseline data for improvement in the treatment modalities and recommends measures for better control of the treatable and curable cancers. It gives an estimate of the number of cancer cases attending the host institute in various disciplines and the exact type of cases diagnosed and classified according to International Classification of Diseases (ICD). In addition, great details of the patient pertaining to socio-demographic characteristics are also obtained. HBCR records all cases in a given hospital, usually without knowledge of the background population; the emphasis is on clinical care, regular routine follow up and hospital administration. It may also form the nucleus for PBCR. This study is an effort to determine the socio-demographic patterns of cancer patients. The present study was carried out in a government tertiary care hospital of India. All the patients suspected of/suffering from cancer, registered in GMCH (Government Medical College and Hospital Sector 32 Chandigarh) in the study time period were enrolled. All the patients so registered in GMCH were screened in different departments for their ailment and those found suspected of suffering from symptoms of cancer were sent for diagnostics to pathology department. After being diagnosed for any benign or malignant cancer, were referred to Radiotherapy department for treatment and further management. These patients comprised our study sample. As per WHO standardized guidelines on patient information for Hospital based cancer registry, detailed information was taken of the patient. Information on socio-demographic profile, medical history, family history and previous treatment, if any, was obtained from the patient. But if the patient couldn't be contacted then information was retrieved from pathology, radiotherapy or medical records department of the hospital. Subjects were explained the purpose of study and those who gave consent to participate in the study were interviewed to collect the desired information on the WHO designed cancer information leaflet. In case of respondents below 18 years of age, assent was taken from parents. Confidentiality of responses was assured. The data was collected, compiled and summarized using percentages, proportions. A chi square test was used to compare proportions. A result yielding a P value less than 5% was considered statistically significant. A total of 712 cancer patients visited GMCH in 6 months of study time. Out of them, 28 patient's data could not be obtained. Hence, 684 patients constituted the study sample, with 359 (52.5%) as females. Most (32.3%) patients were in the age group 60- 69 years. Only 0.8% patients were aged <10 years, and 2.6% were of age 80 years or older. Majority (42.7%) of the patients were illiterate and only 4.5% were postgraduate. Hindu patients were maximum (433; 63.3%), followed by Sikhs (179; 26.5%). Overall, 74.4% of participants were married. Significantly (P < 0.05, χ2 = 4.36) more females (16.9%) than males (37; 8.9%) were widowed. Out of 684 cancer patients, 33.4% belonged to the low socioeconomic status (LES), while 6.6% belonged to the high SES  [Table 1]. From state Haryana, majority of patients (44.4%) got registered in GMCH followed by that from Punjab (28.8%) and Chandigarh (14.0%). [Table 2] shows the distribution pattern of cancers in patients. Most males had ca lung (40.9%), followed by ca secondaries (11.1%) and ca oesophagus (9.8%). Meanwhile, most females had, ca breast (23.9%), followed by ca cervix (11.7%) and ca ovary (11.4%). More males had diabetes mellitus (DM) (25.5%), hypertension (HT) (30.5%) as comorbidity than females [Table 3]. And also smoking (37.5) and alcoholism (24.3) habit was more in males [Table 4]. Cancer registration helps the public health professionals to understand the dynamics of cancer incidence for the formulation of future strategies. In patients so registered with GMCH, females outnumbered males. The results were in contradiction to that of study done in Aizwal  that showed that cancers were more prevalent in males as compared to females. Maximum patients were old and those in childhood as well as reproductive age were less. Kalyani et al., also showed cancers with more prevalence in elderly that may be due to increased life expectancy. It has been seen that illiteracy has direct relation with the prevalence of certain cancers. The reason may be owing to observing of harmful practices. Even in this study more than 40% patients were illiterate, followed by those who had only primary schooling. The study done by Manoharan  showed that cancer gall bladder was more prevalent in illiterate as they were less aware of the risk factors. Similarly in our registry too, maximum cancer patients were illiterate. This could be ascribed to the fact that awareness pertaining to risk factors is less in illiterate people hence, were succumbing to cancer. The results of study done by Swaminathan  also corroborated that men and women who were illiterate had a higher overall cancer incidence rates compared to the educated population. Majority of patients in our study were of Hindu religion. The predominance of cancers in Hindu religion has been cited in many studies. Hindus to be suffering of more cancers as compared to other religions could be because of their predominance in the community. The prevalence of certain customs, practices in different religions, lead to different cancers in religions. In one of the studies, Jain community  was found to be less suffering of cancer which was due to the consumption of diet more in garlic and onion which are found to be cancer protective. Studies  in Christian communities have also shown significantly lower risks for certain cancers than in the general population. Cancer lung (22.3%) in subjects was most prevalent, followed by ca breast (13.1%). In hospital based cancer registry report of PGIMER  (Postgraduate Institute of Medical and Research) during 1984-1993 ca cervix and ca breast in females and ca bronchus in males were the leading sites of cancer. As per report more than 50 per cent cases of ca cervix presented in stage 3 of the disease. Even study done by Bagchi S  depicted that breast cancer epidemic would occur over the next decade as more women adopt Western lifestyles by marrying and bearing children later in life. The patients who had ca mouth (1.6%), cancer tongue (3.5%), pyriform fossa (4.1%), hypopharynx (0.7%), larynx (0.6%) and oesophagus (7.2%) were more in comparison to that of results of PGIMER report. Another study  showed that cancers of the upper alimentary and respiratory tracts (oral cavity, pharynx, larynx, oesophagus, and lung) contribute more than half of the cancers in men and about a quarter in women. Indigenous habits of chewing and smoking seem to be primarily responsible for the high incidence of these cancers in men. As the study was done for 6 months, so exact pattern of cancers so prevalent in the region and neighbouring areas couldn't be estimated. Complete data from patients pertaining to follow up and outcome couldn't be retrieved owing to study period being less. 1. Jemal A, Center MM, DeSantis C, Ward EM. Global patterns of cancer incidence and mortality rates and trends. Cancer Epidemiol Biomarkers Prev 2010;19:1893-907. 2. Kalyani R, Das S, Bindra MS, Kumar H. Cancer profile in the Department of Pathology of Sri Devaraj Urs Medical College, Kolar: A ten years study. Indian J Cancer 2010;47:160-5. 3. Bleyer A, Barr R, Hayes-Lattin B, Thomas D, Ellis C, Anderson B; Biology and Clinical Trials Subgroups of the US National Cancer Institute Progress Review Group in Adolescent and Young Adult Oncology. The distinctive biology of cancer in adolescents and young adults. Nat Rev Cancer 2008;8:288-98. 4. Yeole BB. Role of the cancer registries in determining cancer mortality in Asia? Asian Pac J Cancer Prev 2006;7:489-91. 5. Available form: http://www.scribd.com/doc/18658493/Kuppuswamys-SES-Classification [Last accessed on 2011 June 18]. 6. Phukan RK, Zomawia E, Narain K, Hazarika NC, Mahanta J. Tobacco use and stomach cancer in Mizoram, India. Cancer Epidemiol Biomarkers Prev 2005;14:1892-6. 7. Takiar R, Nadayil D, Nandakumar A. Projections of number of cancer cases in India (2010-2020) by cancer groups. Asian Pac J Cancer Prev 2010;11:1045-9. 8. Manoharan N, Tyagi BB, Raina V. Cancer incidences in rural Delhi-2004-05. Asian Pac J Cancer Prev 2010;11:73-7. 9. Swaminathan R, Selvakumaran R, Esmy PO, Sampath P, Ferlay J, Jissa V, et al. Cancer pattern and survival in a rural district in South India. Cancer Epidemiol 2009;33:325-31. 11. Yadav SP, Sachdeva A. Linking diet, religion and cancer. J Clin Oncol 2007;25:21172. 12. Hoff A, Johannessen-Henry CT, Ross L, Hvidt NC, Johansen C. Religion and reduced cancer risk: What is the explanation? A review. Eur J Cancer 2008;44:2573-9. 13. Gupta BD. Hospital cancer registry program-PGIMER. Available from: http://www.ncrpindia.org/Reports_Publi/Preliminary_Pages_Trend.pdf. Individual registry data-1983-84. 14. Bagchi S. Breast cancer rises in India. CMAJ 2008;179:27. 15. Yeole BB, Kurkure AP, Koyande SS. Geographic variation in cancer incidence and its patterns in urban Maharashtra, 2001. Asian Pac J Cancer Prev 2006;7:385-90. 16. Murthy NS, Rajaram D, Gautham MS, Shivaraj NS, Nandakumar BS, Pruthvish S. Risk of cancer development in India. Asian Pac J Cancer Prev 2011;12:387-91. 17. Hill C. Tobacco epidemiology. Rev Prat 2012;62:325, 327-9. 18. Muwonge R, Ramadas K, Sankila R, Thara S, Thomas G, Vinoda J, et al. Role of tobacco smoking, chewing and alcohol drinking in the risk of oral cancer in Trivandrum, India: A nested case-control design using incident cancer cases. Oral Oncol 2008;44:446-54. 19. Cancela Mde C, Ramadas K, Fayette JM, Thomas G, Muwonge R, Chapuis F, et al. Alcohol intake and oral cavity cancer risk among men in a prospective study in Kerala, India. Community Dent Oral Epidemiol 2009;37:342-9. 20. Chen WY, Rosner B, Hankinson SE, Colditz GA, Willett WC. Moderate alcohol consumption during adult life, drinking patterns, and breast cancer risk. JAMA 2011;306:1884-90. 21. Winstanley MH, Pratt IS, Chapman K, Griffin HJ, Croager EJ, Olver IN, et al. Alcohol and cancer: A position statement from Cancer Council Australia. Med J Aust 2011;194:479-82. 22. Noh GY, Hwang DY, Choi YH, Lee YY. Effect of diabetes mellitus on outcomes of colorectal cancer. J Korean Soc Coloproctol 2010;26:424-8. 23. Chodick G, Heymann AD, Rosenmann L, Green MS, Flash S, Porath A, et al. Diabetes and risk of incident cancer: A large population-based cohort study in Israel. Cancer Causes Control 2010;21:879-87. 24. Grossman E, Messerli FH, Goldbourt U. Antihypertensive therapy and the risk of malignancies. Eur Heart J 2001;21:1343-52. 25. Goon PK, Messerli FH, Lip GY. Hypertension and breast cancer: An association revisited? J Hum Hypertens 2006;20:722-4.